"...In the beginning of the year 1666...I procured me a Triangular glass-Prisme, to try therewith the celebrated Phaenomena of Colours. And in order thereto having darkened my chamber, and made a small hole in my window-shuts, to let in a convenient quantity of the Suns light, I placed my Prisme at his entrance, that it might be thereby refracted to the opposite wall. It was at first a very pleasing divertisement, to view the vivid and intense colours produced thereby." The account was published in 1672, twelve years after the Royal Society, which had its start as an informal scientific salon in London in the 1640s, was officially inaugurated as the UK's national academy. Hundreds of years later, the Society has made it possible for us to experience this moment of discovery as Newton's colleagues must have, funny-looking s's and all, through a sort of online museum of the most famous and influential letters the Society has published in its 350-year lifetime. 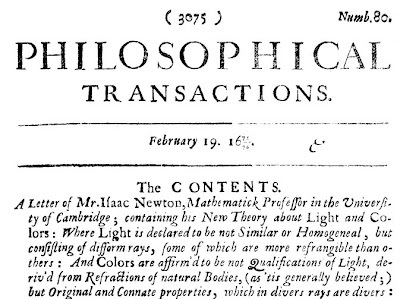 Newton's article and fifty-nine others appear in a virtual timeline spanning 1660 to 2010. The discoveries—Stephen Hawking and Roger Penrose's work on black holes, the invention of the first battery, Bayesian probability—may be familiar, but the presentation of each one, as a humble a letter describing the first foray into a now-established notions about nature, is refreshingly new in its, well, ancientness. Each article comes with a commentary written by a modern-day researcher, summing up the paper's contents and explaining its significance, in case you don't feel like trying to decipher 17th-century fonts; however, the papers themselves, with their beautiful, hand-drawn illustrations and rambling, almost conversational tone, are fun to read. Physics and astronomy are well-represented in the ranks, though something tells me that the medical letters would make good reading for those with a morbid sense of humor. The archive, known as Trailblazing, lets you relive eureka moments from James Prescott Joule's investigations of friction as a source of heat in 1849 to the 1909 experiment that revealed that all the positive charge in an atom must be densely concentrated at its center. Meanwhile, a sprinkling of important events throughout the timeline provide historical context; it might interest you to know that James Clerk Maxwell's theory of electromagnetism came out just as the American Civil War was ending, or that Newton was playing with a prism in his darkened room at Cambridge the same year that the great fire of London raged. 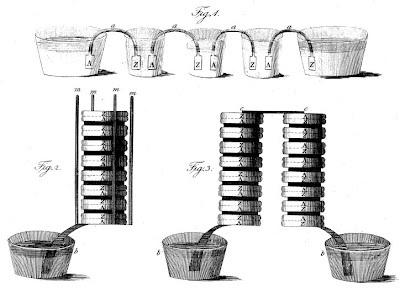 Alessandro Volta's drawings from a letter describing a battery. I thought I'd heard that the famous story about Ben Franklin flying kites in thunderstorms was apocryphal, but in the Royal Society archive you can find Franklin's comically blithe description of how scientists who were skeptical of his idea that lightning was a form of electricity could demonstrate this fact for themselves. After you've rigged up your silk kite with a foot-long metal wire, Franklin writes, "the kite is to be raised, when a thunder-gust appears to be coming on, (which is very frequent in this country)," in order to attract the "electric fire from the clouds." The scientist is supposed to hold onto a silk ribbon, attached to a metal key; Franklin admonishes a would-be lightning catcher to "stand within a door, or window, or under some cover, so that the silk riband may not be wet; and care must be taken, that the twine does not touch the frame of the door or window." Meanwhile, the "pointed wire will draw the electric fire…and the kite, with all the twine, will be electrified; and the loose filaments of the twine will stand out every way, and be attracted by an approaching finger." The key, he goes on to explain, can be used as a source of charge for any static electricity experiments, thus proving that lightning isn't the wrath of the gods but a form of electricity. As commentator Mark Miodownik writes, "It worked and, miraculously, did not kill him."